As language industry professionals, we’re always going on about the benefits of translation technology. But what if you’re just heading off on holiday and you need to communicate? As much as we’d love to see people buying languages all the time, hiring a professional interpreter when you head off on holiday is ridiculous. So, for those of you who are wishing it’s summer already, here are 5 of the top translation apps for 2019 that are worth their weight in gold! As professional linguists, we hate Google translate. But when we take our work hat off, it’s an amazing piece of software that’s constantly evolving. It currently supports 103 languages, with 52 of them being available offline, too. If you use your camera and point it at the foreign text, it’ll translate it using AR. If you’re unable to type, SayHi is the perfect app for you. All you have to do is speak into your microphone and the app will work it’s magic. It’ll transcribe what’s said and translate it so the person you’re communicating with can read or hear what you said in their language. 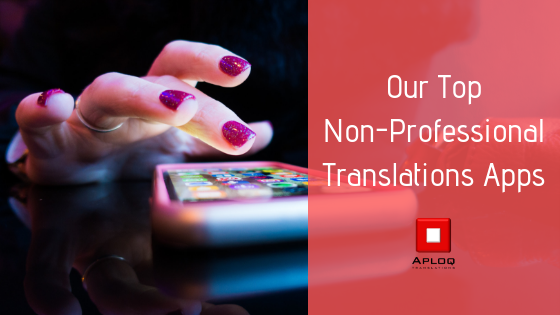 This is probably the most versatile translation app out there, as it has both a personal and professional version. Users can choose if they want to type, speak or translate a picture. It’s also available as a smartwatch app! If you’re traveling across Asia, this translation app is a must. It’ll help you avoid nasty surprises by translating restaurant menus into English. If you want to learn more about the country your visiting, this app takes a journey into the culture, customs, and etiquette of the country you’re visiting. It’ll help you learn by using flashcards, and will even give you a crash course in local slang! And, of course, if you’re looking for something a bit more professional, you know where to find us! Previous: Previous post: Marketing in the translation industry – what works?